The Lindberg Lab logo recognizes Evolution, Development and Ecology as the three core areas of its research in Integrative and Paleo Biology while the cladogram represents the central role of phylogeny in these studies. The prefix in LindLab is Swedish for Tilia sp.  the Linden Tree. Thus, its use in our lab name is a double entendre denoting the labs principal investigator and the importance of phylogenetic trees in our research program. Phylogenetics (evolutionary relationships) is at the core of our studies, and the evolutionary history, interactions, and relationships of the taxa that we study are the threads that unite the various temporal and spatial scales of our research. Our programs primarily center on the evolution of Molluscs and on rocky, near shore marine habitats. Although rocky shores account for over 30% of the worlds coastlines, large spatial and temporal patterns in these habitats are seldom addressed. Most of our studies focus on the evolution of select groups (taxa) of molluscs, their changing habitats, and the resultant interactions among organisms and between organisms and their habitats through time. Our studies are based along much of the Pacific Rim, including the Aleutian Islands, California and related island groups, the islands of Baja California, Mexico, and the temperate coasts of Chile and Australia. Research at this scale requires a wide variety of techniques and members of the Lab incorporate paleontological, geological, and biogeographical data, in addition to comparative morphology, developmental biology, molecular techniques, long-term experimental manipulations, and phylogenetics in our studies. The following studies are very precise and focused, and contribute to a greater understanding of an incredibly diverse and widespread group of organisms  the Molluscs. 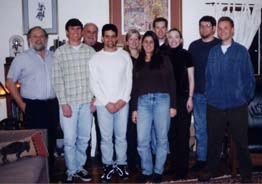 The LindLab (from left): David Lindberg, Jim Kurpius, Barry Roth, Brian Simison, Sharon Moshel-Lynch, Alicia Cordero, Ross Nehm, Kirsten Lindstrom, Rob Guralnick and Paul Bunje.